The alkali metals are a group (column) in the periodic table consisting of the chemical elements lithium (Li), sodium (Na),[note 1] potassium (K),[note 2] rubidium (Rb), caesium (Cs),[note 3] and francium (Fr). This group lies in the s-block of the periodic table as all alkali metals have their outermost electron in an s-orbital: this electron configuration results in their characteristic properties. The alkali metals provide the best example of group trends in properties in the periodic table, with elements exhibiting well-characterized homologous behaviour. The alkali metals have very similar properties: they are all shiny, soft, highly reactive metals at standard temperature and pressure and readily lose their outermost electron to form cations with charge +1. :28 They can all be cut easily with a knife due to their softness, exposing a shiny surface that tarnishes rapidly in air due to oxidation by atmospheric moisture and oxygen. Because of their high reactivity, they must be stored under oil to prevent reaction with air, and are found naturally only in salts and never as the free element. In the modern IUPAC nomenclature, the alkali metals comprise the group 1 elements,[note 4] excluding hydrogen (H), which is nominally a group 1 element but not normally considered to be an alkali metal as it rarely exhibits behaviour comparable to that of the alkali metals. All the alkali metals react with water, with the heavier alkali metals reacting more vigorously than the lighter ones. The alkali metals are a group (column) in the periodic table consisting of the chemical elements lithium (Li), sodium (Na), potassium(K),[note 1] rubidium (Rb), caesium (Cs),[note 2] and francium (Fr). This group lies in the s-block of the periodic table of elements as all alkali metals have their outermost electron in an s-orbital: this element/electron configuration results in their characteristic properties. The alkali metals provide the best example of group trends in properties in the periodic table, with elements exhibiting well-characterizedhomologous behaviour. The alkali metals have very similar properties: they are all shiny, soft, highly reactive metals at standard temperature and pressure and readily lose their outermost electron to form cations with charge +1. They can all be cut easily with a knife due to their softness, exposing a shiny surface that tarnishes rapidly in air due to oxidation by atmospheric moisture and oxygen. Because of their high reactivity, they must be stored under oil to prevent reaction with air, and are found naturally only in salts and never as the free element. In the modernIUPAC nomenclature, the alkali metals comprise the group 1 elements,[note 3] excluding hydrogen (H), which is nominally a group 1 element but not normally considered to be an alkali metal as it rarely exhibits behaviour comparable to that of the alkali metals. All the alkali metals react with water, with the heavier alkali metals reacting more vigorously than the lighter ones. All of the discovered alkali metals occur in nature: in order of abundance, sodium is the most abundant, followed by potassium, lithium, rubidium, caesium, and finally francium, which is very rare due to its extremely high radioactivity and thus occurs only in traces due to its presence in natural decay chains. 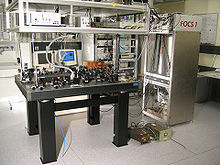 Experiments have been conducted to attempt the synthesis of ununennium (Uue), which is likely to be the next member of the group, but they have all met with failure. However, ununennium may not be an alkali metal due to relativistic effects, which are predicted to have a large influence on the chemical properties of superheavy elements; even if it does turn out to be an alkali metal, it is predicted to have some differences in physical and chemical properties from its lighter homologues. Most alkali metals have many different applications. Two of the most well-known applications of the pure elements are rubidium and caesium atomic clocks, of which caesium atomic clocks are the most accurate and precise representation of time. A common application of the compounds of sodium is the sodium-vapour lamp, which emits very efficient light. Table salt, or sodium chloride, has been used since antiquity. Sodium and potassium are also essential elements, having major biological roles as electrolytes, and although the other alkali metals are not essential, they also have various effects on the body, both beneficial and harmful. The physical and chemical properties of the alkali metals can be readily explained by their having an ns1 valence electron configuration, which results in weak metallic bonding. Hence, all the alkali metals are soft and have low densities, melting and boiling points, as well as heats of sublimation, vaporisation, and dissociation:74 They all crystallize in the body-centered cubic crystal structure,:73 and have distinctive flame colours because their outer s electron is very easily excited. :75 The ns1 configuration also results in the alkali metals having very large atomic and ionic radii, as well as high thermal and electrical conductivity. :75 Their chemistry is dominated by the loss of their lone valence electron to form the +1 oxidation state, due to the ease of ionizing this electron and the very high second ionization energy. :76 Most of the chemistry has been observed only for the first five members of the group. The chemistry of francium is not well established due to its extreme radioactivity; thus, the presentation of its properties here is limited. Electrical resistivity at 298 K (nΩ·cm) 94.7 48.8 73.9 131 208 ? All the alkali metals are highly reactive and are never found in elemental forms in nature. Because of this, they are usually stored inmineral oil or kerosene (paraffin oil). They react aggressively with the halogens to form the alkali metal halides, which are white ionic crystalline compounds that are all soluble in water except lithium fluoride (LiF). The alkali metals also react with water to form stronglyalkaline hydroxides and thus should be handled with great care. The heavier alkali metals react more vigorously than the lighter ones; for example, when dropped into water, caesium produces a larger explosion than potassium. The alkali metals have the lowest firstionisation energies in their respective periods of the periodic table because of their low effective nuclear charge and the ability to attain a noble gas configuration by losing just one electron. 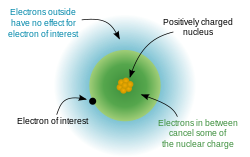 The second ionisation energy of all of the alkali metals is very high as it is in a full shell that is also closer to the nucleus; thus, they almost always lose a single electron, forming cations. :28 The alkalides are an exception: they are unstable compounds which contain alkali metals in a −1 oxidation state, which is very unusual as before the discovery of the alkalides, the alkali metals were not expected to be able to form anions and were thought to be able to appear in salts only as cations. The alkalide anions have filled s-subshells, which gives them more stability and allows them to exist. All the stable alkali metals except lithium are known to be able to form alkalides, and the alkalides have much theoretical interest due to their unusual stoichiometry and low ionisation potentials. Alkalides are chemically similar to the electrides, which are salts with trapped electrons acting as anions. A particularly striking example of an alkalide is “inverse sodium hydride“, H+Na− (both ions being complexed), as opposed to the usual sodium hydride, Na+H−: it is unstable in isolation, due to its high energy resulting from the displacement of two electrons from hydrogen to sodium, although several derivatives are predicted to be metastable or stable. In aqueous solution, the alkali metal ions form aqua ions of the formula [M(H2O)n]+, where n is the solvation number. Their coordination numbers and shapes agree well with those expected from their ionic radii. In aqueous solution the water molecules directly attached to the metal ion are said to belong to the first coordination sphere, also known as the first, or primary, solvation shell. The bond between a water molecule and the metal ion is a dative covalent bond, with the oxygen atom donating both electrons to the bond. Each coordinated water molecule may be attached by hydrogen bonds to other water molecules. The latter are said to reside in the second coordination sphere. However, for the alkali metal cations, the second coordination sphere is not well-defined as the +1 charge on the cation is not high enough to polarize the water molecules in the primary solvation shell enough for them to form strong hydrogen bonds with those in the second coordination sphere, producing a more stable entity. 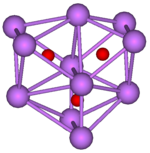 :25 The solvation number for Li+ has been experimentally determined to be 4, forming the tetrahedral [Li(H2O)4]+: while solvation numbers of 3 to 6 have been found for lithium aqua ions, solvation numbers less than 4 may be the result of the formation of contact ion-pairs, and the higher solvation numbers may be interpreted in terms of water molecules that approach [Li(H2O)4]+ through a face of the tetrahedron, though molecular dynamic simulations may indicate the existence of an octahedral hexaaqua ion. There are also probably six water molecules in the primary solvation sphere of the sodium ion, forming the octahedral [Na(H2O)6]+ ion. 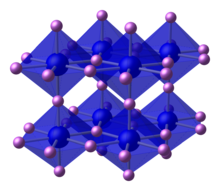 :126–127 While it was previously thought that the heavier alkali metals also formed octahedral hexaaqua ions, it has since been found that potassium and rubidium probably form the [K(H2O)8]+ and [Rb(H2O)8]+ ions, which have the square antiprismaticstructure, and that caesium forms the 12-coordinate [Cs(H2O)12]+ ion. The chemistry of lithium shows several differences from that of the rest of the group as the small Li+ cation polarises anions and gives its compounds a more covalentcharacter. Lithium and magnesium have a diagonal relationship due to their similar atomic radii, so that they show some similarities. For example, lithium forms a stablenitride, a property common among all the alkaline earth metals (magnesium’s group) but unique among the alkali metals. In addition, among their respective groups, only lithium and magnesium form covalent organometallic compounds (e.g. LiMe and MgMe2). Francium is also predicted to show some differences due to its high atomic weight, causing its electrons to travel at considerable fractions of the speed of light and thus makingrelativistic effects more prominent. In contrast to the trend of decreasing electronegativities and ionisation energies of the alkali metals, francium’s electronegativity and ionisation energy are predicted to be higher than caesium’s due to the relativistic stabilisation of the 7s electrons; also, its atomic radius is expected to be abnormally low. :1729 All known physical properties of francium also deviate from the clear trends going from lithium to caesium, such as the first ionisation energy, electron affinity, and anion polarizability. The CsFr molecule is also polarized as Cs+Fr−, showing that the 7s subshell of francium is much more strongly affected by relativistic effects than the 6s subshell of caesium. Additionally, francium superoxide (FrO2) is expected to have covalent character, unlike the other alkali metal superoxides, because of bonding contributions from the 6p electrons of francium. Due to the great rarity of odd–odd nuclei, almost all the primordial isotopes of the alkali metals are odd–even (the exceptions being the light stable isotope lithium-6 and the long-lived radioisotopepotassium-40 and rubidium-87). For a given odd mass number, there can be only a single beta-stable nuclide, since there is not a difference in binding energy between even–odd and odd–even comparable to that between even–even and odd–odd, leaving other nuclides of the same mass number (isobars) free to beta decay toward the lowest-mass nuclide. An effect of the instability of an odd number of either type of nucleons is that odd-numbered elements, such as the alkali metals, tend to have fewer stable isotopes than even-numbered elements. Of the 26 monoisotopic elements that have only a single stable isotope, all but one have an odd atomic number and all but one also have an even number of neutrons. Beryllium is the single exception to both rules, due to its low atomic number. All of the alkali metals except lithium and caesium have at least one naturally occurring radioisotope: sodium-22 and sodium-24 are trace radioisotopes producedcosmogenically, potassium-40 and rubidium-87 have very long half-lives and thus occur naturally, and all isotopes of francium are radioactive. Caesium was also thought to be radioactive in the early 20th century, although it has no naturally occurring radioisotopes. (Francium had not been discovered yet at that time.) The natural radioisotope of potassium, potassium-40, makes up about 0.012% of natural potassium, and thus natural potassium is weakly radioactive. This natural radioactivity became a basis for a mistaken claim of the discovery for element 87 (the next alkali metal after caesium) in 1925. Caesium-137, with a half-life of 30.17 years, is one of the two principal medium-lived fission products, along with strontium-90, which are responsible for most of the radioactivityof spent nuclear fuel after several years of cooling, up to several hundred years after use. It constitutes most of the radioactivity still left from the Chernobyl accident. 137Cs undergoes high-energy beta decay and eventually becomes stable barium-137. It is a strong emitter of gamma radiation. 137Cs has a very low rate of neutron capture and cannot be feasibly disposed of in this way, but must be allowed to decay. 137Cs has been used as a tracer in hydrologic studies, analogous to the use of tritium. Small amounts ofcaesium-134 and caesium-137 were released into the environment during nearly all nuclear weapon tests and some nuclear accidents, most notably the Goiânia accident and the Chernobyl disaster. As of 2005, caesium-137 is the principal source of radiation in the zone of alienation around the Chernobyl nuclear power plant. Electronegativity is a chemical property that describes the tendency of an atom or a functional group to attract electrons (orelectron density) towards itself. If the bond between sodium and chlorine in sodium chloride were covalent, the pair of shared electrons would be attracted to the chlorine because the effective nuclear charge on the outer electrons is +7 in chlorine but is only +1 in sodium. The electron pair is attracted so close to the chlorine atom that they are practically transferred to the chlorine atom (an ionic bond). However, if the sodium atom was replaced by a lithium atom, the electrons will not be attracted as close to the chlorine atom as before because the lithium atom is smaller, making the electron pair more strongly attracted to the closer effective nuclear charge from lithium. Hence, the larger alkali metal atoms (further down the group) will be less electronegative as the bonding pair is less strongly attracted towards them. Because of the higher electronegativity of lithium, some of its compounds have a more covalent character. For example,lithium iodide (LiI) will dissolve in organic solvents, a property of most covalent compounds. Lithium fluoride (LiF) is the only alkali halide that is not soluble in water, and lithium hydroxide (LiOH) is the only alkali metal hydroxide that is notdeliquescent. Recent research has suggested that the explosive behavior of alkali metals in water is driven by a Coulomb explosion rather than solely by rapid generation of hydrogen itself. All alkali metals melt as a part of the reaction with water. Water molecules ionize the bare metallic surface of the liquid metal, leaving a positively charged metal surface and negatively charged water ions. The attraction between the charged metal and water ions will rapidly increase the surface area, causing an exponential increase of ionization. When the repulsive forces within the liquid metal surface exceeds the forces of the surface tension, it vigorously explodes. 8). Upon heating of KC8, the elimination of potassium atoms results in the conversion in sequence to KC24, KC36, KC48 and finally KC60. KC8 is a very strong reducing agent and is pyrophoric and explodes on contact with water. While the large alkali metals (K, Rb, and Cs) initially form MC8, the smaller ones initially form MC6. All the alkali metals react readily with phosphorus and arsenic to form phosphides and arsenides with the formula M3Pn (where M represents an alkali metal and Pn represents a pnictogen). This is due to the greater size of the P3− and As3− ions, so that less lattice energy needs to be released for the salts to form. These are not the only phosphides and arsenides of the alkali metals: for example, potassium has nine different known phosphides, with formulae K3P, K4P3, K5P4, KP, K4P6, K3P7, K3P11, KP10.3, and KP15. While most metals form arsenides, only the alkali and alkaline earth metals form mostly ionic arsenides. The structure of Na3As is complex with unusually short Na–Na distances of 328–330 pm which are shorter than in sodium metal, and this indicates that even with these electropositive metals the bonding cannot be straightforwardly ionic. 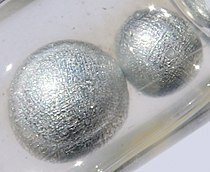 Other alkali metal arsenides not conforming to the formula M3As are known, such as LiAs, which has a metallic lustre and electrical conductivity indicating the presence of some metallic bonding. The antimonides are unstable and reactive as the Sb3− ion is a strong reducing agent; reaction of them with acids form the toxic and unstable gas stibine (SbH3). Bismuthides are not even wholly ionic; they are intermetallic compounds containing partially metallic and partially ionic bonds. 2 ion), and many others. 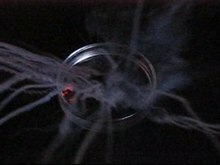 Lithium burns in air to form lithium oxide, but sodium reacts with oxygen to form a mixture of sodium oxide and sodium peroxide. Potassium forms a mixture of potassium peroxide andpotassium superoxide, while rubidium and caesium form the superoxide exclusively. Their reactivity increases going down the group: while lithium, sodium and potassium merely burn in air, rubidium and caesium are pyrophoric (spontaneously catch fire in air). x ions. The alkali metal polonides are all ionic compounds containing the Po2− ion; they are very chemically stable and can be produced by direct reaction of the elements at around 300–400 °C. The alkali metals are among the most electropositive elements on the periodic table and thus tend to bond ionically to the most electronegative elements on the periodic table, the halogens, forming salts known as the alkali metal halides. The reaction is very vigorous and can sometimes result in explosions. :76 This includes sodium chloride, otherwise known as common salt. The reactivity becomes higher from lithium to caesium and drops from fluorine to iodine. All of the alkali metal halides have the formula MX where M is an alkali metal and X is a halogen. They are all white ionic crystalline solids. 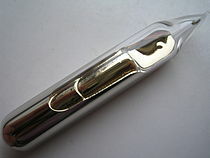 All the alkali metal halides are soluble in water except for lithium fluoride (LiF), which is insoluble in water due to its very high lattice enthalpy. The high lattice enthalpy of lithium fluoride is due to the small sizes of the Li+ and F− ions, causing the electrostatic interactions between them to be strong: a similar effect occurs for magnesium fluoride, which lithium has a diagonal relationship with. :76 The alkali metals also react similarly with hydrogen to form ionic alkali metal hydrides. 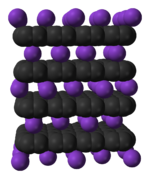 Structure of 2.2.2-Cryptandencapsulating a potassium cation (purple). At crystalline state, obtained with an X-ray diffraction. Alkali metal cations do not usually form coordination complexes with simple Lewis bases due to their low charge of just +1 and their relatively large size; thus the Li+ ion forms most complexes and the heavier alkali metal ions form less and less. Inaqueous solution, the alkali metal ions exist as octahedral hexahydrate complexes ([M(H2O)6)]+), with the exception of the lithium ion, which due to its small size forms tetrahedral tetrahydrate complexes ([Li(H2O)4)]+); the alkali metals form these complexes because their ions are attracted by electrostatic forces of attraction to the polar water molecules. Because of this,anhydrous salts containing alkali metal cations are often used as desiccants. Alkali metals also readily form complexes withcrown ethers (e.g. 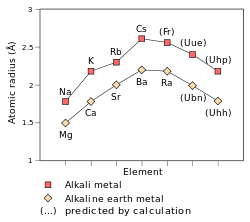 12-crown-4 for Li+, 15-crown-5 for Na+, and 18-crown-6 for K+) and cryptands due to electrostatic attraction. The alkali metals dissolve slowly in liquid ammonia, forming hydrogen gas and the alkali metal amide (MNH2, where M represents an alkali metal): this was first noted by Humphry Davy in 1809 and rediscovered by W. Weyl in 1864. The process may be speeded up by a catalyst. Similar solutions are formed by the heavy divalent alkaline earth metals and lanthanides calcium, strontium, barium, europium, andytterbium. The amide salt is quite insoluble and readily precipitates out of solution, leaving intensely coloured ammonia solutions of the alkali metals. In 1907, Charles Krause identified the colour as being due to the presence of solvated electrons, which contribute to the high electrical conductivity of these solutions. At low concentrations (below 3 M), the solution is dark blue and has ten times the conductivity of aqueous sodium chloride; at higher concentrations (above 3 M), the solution is copper-coloured and has approximately the conductivity of liquid metals like mercury. In addition to the alkali metal amide salt and solvated electrons, such ammonia solutions also contain the alkali metal cation (M+), the neutral alkali metal atom (M), diatomic alkali metal molecules (M2) and alkali metal anions (M−). These are unstable and eventually become the more thermodynamically stable alkali metal amide and hydrogen gas. Solvated electrons are powerful reducing agents and are often used in chemical synthesis. Being the smallest alkali metal, lithium forms the widest variety of and most stable organometallic compounds, which are bonded covalently.Organolithium compounds are electrically non-conducting volatile solids or liquids that melt at low temperatures, and tend to form oligomerswith the structure (RLi)x where R is the organic group. As the electropositive nature of lithium puts most of the charge density of the bond on the carbon atom, effectively creating a carbanion, organolithium compounds are extremely powerful bases and nucleophiles. For use as bases, butyllithiums are often used and are commercially available. An example of an organolithium compound is methyllithium ((CH3Li)x), which exists in tetrameric (x = 4) and hexameric (x = 6) forms. The application of organosodium compounds in chemistry is limited in part due to competition from organolithium compounds, which are commercially available and exhibit more convenient reactivity. The principal organosodium compound of commercial importance is sodium cyclopentadienide. Sodium tetraphenylborate can also be classified as an organosodium compound since in the solid state sodium is bound to the aryl groups. Organometallic compounds of the higher alkali metals are even more reactive than organosodium compounds and of limited utility. A notable reagent is Schlosser’s base, a mixture of n-butyllithium and potassium tert-butoxide. This reagent reacts with propeneto form the compound allylpotassium (KCH2CHCH2). cis-2-Butene and trans-2-butene equilibrate when in contact with alkali metals. Whereasisomerization is fast with lithium and sodium, it is slow with the higher alkali metals. The higher alkali metals also favour the sterically congested conformation. Several crystal structures of organopotassium compounds have been reported, establishing that they, like the sodium compounds, are polymeric. Organosodium, organopotassium, organorubidium and organocaesium compounds are all mostly ionic and are insoluble (or nearly so) in nonpolar solvents. The stabilisation of ununennium’s valence electron and thus the contraction of the 8s orbital cause its atomic radius to be lowered to 240 pm,:1729–1730 very close to that of rubidium (247 pm), so that the chemistry of ununennium in the +1 oxidation state should be more similar to the chemistry of rubidium than to that of francium. On the other hand, the ionic radius of the Uue+ ion is predicted to be larger than that of Rb+, because the 7p orbitals are destabilised and are thus larger than the p-orbitals of the lower shells. Ununennium may also show the +3oxidation state,:1729–1730 which is not seen in any other alkali metal,:28 in addition to the +1 oxidation state that is characteristic of the other alkali metals and is also the main oxidation state of all the known alkali metals: this is because of the destabilisation and expansion of the 7p3/2 spinor, causing its outermost electrons to have a lower ionisation energy than what would otherwise be expected. :28:1729–1730Indeed, many ununennium compounds are expected to have a large covalent character, due to the involvement of the 7p3/2 electrons in the bonding. The probable properties of further alkali metals beyond unhexpentium have not been explored yet as of 2012. In periods 8 and above of the periodic table, relativistic and shell-structure effects become so strong that extrapolations from lighter congeners become completely inaccurate. In addition, the relativistic and shell-structure effects (which stabilise the s-orbitals and destabilise and expand the d-, f-, and g-orbitals of higher shells) have opposite effects, causing even larger difference between relativistic and non-relativistic calculations of the properties of elements with such high atomic numbers. :1732–1733 Interest in the chemical properties of ununennium and unhexpentium stems from the fact that both elements are located close to the expected locations of islands of stabilities, centered at elements 122 (306Ubb) and 164 (482Uhq). The element hydrogen, with one electron per neutral atom, is usually placed at the top of Group 1 of the periodic table for convenience, but hydrogen is not normally considered to be an alkali metal; when it is considered to be an alkali metal, it is because of its atomic properties and not its chemical properties. Under typical conditions, pure hydrogen exists as a diatomic gas consisting of two atoms permolecule (H2); however, the alkali metals only form diatomic molecules (such as dilithium, Li2) at high temperatures, when they are in the gaseous state. Hydrogen, like the alkali metals, has one valence electron and reacts easily with the halogens but the similarities end there. Its placement above lithium is primarily due to its electron configuration and not its chemical properties. It is sometimes placed abovecarbon due to their similar electronegativities or fluorine due to their similar chemical properties. The first ionisation energy of hydrogen (1312.0 kJ/mol) is much higher than that of the alkali metals. As only one additional electron is required to fill in the outermost shell of the hydrogen atom, hydrogen often behaves like a halogen, forming the negative hydride ion, and is sometimes considered to be a halogen. (The alkali metals can also form negative ions, known as alkalides, but these are little more than laboratory curiosities, being unstable.) It was expected for some time that liquid hydrogen would show metallic properties; while this has been shown to not be the case, under extremely high pressures, such as those found at the cores of Jupiter and Saturn, hydrogen does become metallic and behaves like an alkali metal; in this phase, it is known as metallic hydrogen. The electrical resistivity of liquid metallic hydrogen at 3000 K is approximately equal to that of liquid rubidium and caesium at 2000 K at the respective pressures when they undergo a nonmetal-to-metal transition. The 1s1 electron configuration of hydrogen, while superficially similar to that of the alkali metals (ns1), is unique because there is no 1p subshell. Hence it can lose an electron to form the hydron H+, or gain one to form the hydride ion H−. :43 In the former case it resembles superficially the alkali metals; in the latter case, the halogens, but the differences due to the lack of a 1p subshell are important enough that neither group fits the properties of hydrogen well. :43 Group 14 is the best fit in terms of thermodynamic properties such as ionization energy and electron affinity, but none of the three placements are entirely satisfactory. As an example of hydrogen’s unorthodox properties stemming from its unusual electron configuration and small size, the hydrogen ion is very small (radius around 150 fm compared to the 50–220 pm size of most other atoms and ions) and so is nonexistent in condensed systems other than in association with other atoms or molecules. Indeed, transferring of protons between chemicals is the basis of acid-base chemistry. :43 Also unique is hydrogen’s ability to form hydrogen bonds, which are an effect of charge-transfer, electrostatic, and electron correlative contributing phenomena.While analogous lithium bonds are also known, they are mostly electrostatic. Nevertheless, hydrogen can perform the same structural role as the alkali metals in some molecular crystals, and has a close relationship with the lightest alkali metals (especially lithium). 4 ions in a sea of electrons) at very high pressures (though less than the typical pressure where transitions from insulating to metallic behaviour occur around, 100 GPa), and could possibly occur inside the ice giants Uranus and Neptune, which may have significant impacts on their interior magnetic fields. It has been estimated that the transition from a mixture of ammonia and dihydrogen molecules to metallic ammonium may occur at pressures just below 25 GPa. Thallium displays the +1 oxidation state:28 that all the known alkali metals display,:28 and thallium compounds with thallium in its +1oxidation state closely resemble the corresponding potassium or silver compounds stoichiometrically due to the similar ionic radii of the Tl+(164 pm), K+ (152 pm) and Ag+ (129 pm) ions. 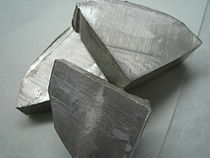 It was sometimes considered an alkali metal in continental Europe (but not in England) in the years immediately following its discovery,:126 and was placed just after caesium as the sixth alkali metal in Dmitri Mendeleev‘s 1869 periodic table and Julius Lothar Meyer‘s 1868 periodic table. (Mendeleev’s 1871 periodic table and Meyer’s 1870 periodic table put thallium in its current position in the boron group and leave the space below caesium blank.) However, thallium also displays the oxidation state +3,:28 which no known alkali metal displays:28 (although ununennium, the undiscovered seventh alkali metal, is predicted to possibly display the +3 oxidation state). :1729–1730 The sixth alkali metal is now considered to be francium.While Tl+ is stabilized by the inert pair effect, this inert pair of 6s electrons is still able to participate chemically, so that these electrons are stereochemically active in aqueous solution. 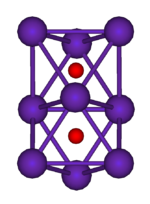 Additionally, the thallium halides (except TlF) are quite insoluble in water, and TlI has an unusual structure because of the presence of the inert pair in thallium. The group 11 metals (or coinage metals), copper, silver, and gold, are typically categorised as transition metals given they can form ions with incomplete d-shells. Physically, they have the relatively low melting points and high electronegativity values associated with post-transition metals. “The filled d subshell and free s electron of Cu, Ag, and Au contribute to their high electrical and thermal conductivity. Transition metals to the left of group 11 experience interactions between s electrons and the partially filled d subshell that lower electron mobility.” Chemically, the group 11 metals behave like main-group metals in their +1 valence states, and are hence somewhat related to the alkali metals: this is one reason for their previously being labelled as “group IB”, paralleling the alkali metals’ “group IA”. They are occasionally classified as post-transition metals. Their spectra are however analogous to those of the alkali metals. In Mendeleev’s 1871 periodic table, copper, silver, and gold are listed twice, once under group VIII (with the iron triad and platinum group metals), and once under group IB. Group IB was nonetheless parenthesized to note that it was tentative. Mendeleev’s main criterion for group assignment was the maximum oxidation state of an element: on that basis, the group 11 elements could not be classified in group IB, due to the existence of Cu(II) and Au(III) compounds being known at that time. However, eliminating group IB would make group I the only main group (group VIII was labelled a transition group) to lack an A–B bifurcation. Soon afterwards, a majority of chemists chose to classify these elements in group IB and remove them from group VIII for the resulting symmetry: this was the predominant classification until the rise of the modern medium-long 18-column periodic table, which separated the alkali metals and group 11 metals. Pure potassium was first isolated in 1807 in England by Sir Humphry Davy, who derived it from caustic potash (KOH, potassium hydroxide) by the use of electrolysis of the molten salt with the newly invented voltaic pile. Previous attempts at electrolysis of the aqueous salt were unsuccessful due to potassium’s extreme reactivity. :68 Potassium was the first metal that was isolated by electrolysis. Later that same year, Davy reported extraction of sodium from the similar substance caustic soda (NaOH, lye) by a similar technique, demonstrating the elements, and thus the salts, to be different. Later that year, the first pieces of pure molten sodium metal were similarly prepared by Humphry Davy through the electrolysis of molten caustic soda (now called sodium hydroxide). 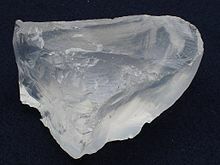 Petalite (LiAlSi4O10) was discovered in 1800 by the Brazilian chemist José Bonifácio de Andrada in a mine on the island of Utö, Sweden.However, it was not until 1817 that Johan August Arfwedson, then working in the laboratory of the chemist Jöns Jacob Berzelius, detected the presence of a new element while analysing petalite ore. This new element was noted by him to form compounds similar to those of sodium and potassium, though its carbonate and hydroxide were less soluble in water and more alkaline than the other alkali metals. 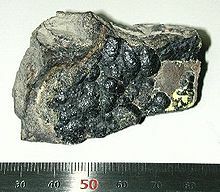 Berzelius gave the unknown material the name “lithion/lithina“, from the Greek word λιθoς (transliterated as lithos, meaning “stone”), to reflect its discovery in a solid mineral, as opposed to potassium, which had been discovered in plant ashes, and sodium, which was known partly for its high abundance in animal blood. He named the metal inside the material “lithium“. Lithium, sodium, and potassium were part of the discovery of periodicity, as they are among a series of triads of elements in the same group that were noted by Johann Wolfgang Döbereiner in 1850 as having similar properties. After 1869, Dmitri Mendeleev proposed his periodic table placing lithium at the top of a group with sodium, potassium, rubidium, caesium, and thallium. Two years later, Mendeleev revised his table, placing hydrogen in group 1 above lithium, and also moving thallium to the boron group. In this 1871 version, copper, silver, and gold were placed twice, once as part of group IB, and once as part of a “group VIII” encompassing today’s groups 8 to 11. [note 11] After the introduction of the 18-column table, the group IB elements were moved to their current position in thed-block, while alkali metals were left in group IA. Later the group’s name was changed to group 1 in 1988. The trivial name “alkali metals” comes from the fact that the hydroxides of the group 1 elements are all strong alkalis when dissolved in water. The next element below francium (eka-francium) is very likely to be ununennium (Uue), element 119,:1729–1730 although this is not completely certain due to relativistic effects.The synthesis of ununennium was first attempted in 1985 by bombarding a target ofeinsteinium-254 with calcium-48 ions at the superHILAC accelerator at Berkeley, California. No atoms were identified, leading to a limiting yield of 300 nb. Estimated abundances of the chemical elements in the Solar system. Hydrogen and helium are most common, from the Big Bang. The next three elements (lithium, beryllium, and boron) are rare because they are poorly synthesized in the Big Bang and also in stars. The two general trends in the remaining stellar-produced elements are: (1) an alternation of abundance in elements as they have even or odd atomic numbers, and (2) a general decrease in abundance, as elements become heavier. Iron is especially common because it represents the minimum energy nuclide that can be made by fusion of helium in supernovae. The Oddo–Harkins rule holds that elements with even atomic numbers are more common that those with odd atomic numbers, with the exception of hydrogen. This rule argues that elements with odd atomic numbers have one unpaired proton and are more likely to capture another, thus increasing their atomic number. In elements with even atomic numbers, protons are paired, with each member of the pair offsetting the spin of the other, enhancing stability. All the alkali metals have odd atomic numbers and they are not as common as the elements with even atomic numbers adjacent to them (the noble gasesand the alkaline earth metals) in the Solar System. The heavier alkali metals are also less abundant than the lighter ones as the alkali metals from rubidium onward can only be synthesized in supernovae and not instellar nucleosynthesis. Lithium is also much less abundant than sodium and potassium as it is poorly synthesized in both Big Bang nucleosynthesis and in stars: the Big Bang could only produce trace quantities of lithium, beryllium and boron due to the absence of a stable nucleus with 5 or 8 nucleons, and stellar nucleosynthesis could only pass this bottleneck by the triple-alpha process, fusing three helium nuclei to form carbon, and skipping over those three elements. The Earth formed from the same cloud of matter that formed the Sun, but the planets acquired different compositions during the formation and evolution of the solar system. In turn, the natural history of the Earth caused parts of this planet to have differing concentrations of the elements. The mass of the Earth is approximately 5.98×1024 kg. It is composed mostly of iron (32.1%), oxygen (30.1%), silicon (15.1%), magnesium(13.9%), sulfur (2.9%), nickel (1.8%), calcium (1.5%), and aluminium (1.4%); with the remaining 1.2% consisting of trace amounts of other elements. Due to mass segregation, the core region is believed to be primarily composed of iron (88.8%), with smaller amounts of nickel (5.8%), sulfur (4.5%), and less than 1% trace elements. The alkali metals, due to their high reactivity, do not occur naturally in pure form in nature. They are lithophiles and therefore remain close to the Earth’s surface because they combine readily with oxygen and so associate strongly with silica, forming relatively low-density minerals that do not sink down into the Earth’s core. Potassium, rubidium and caesium are also incompatible elements due to their large ionic radii. Rubidium is approximately as abundant as zinc and more abundant than copper. 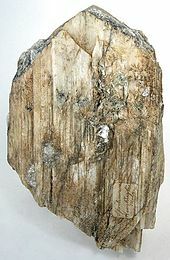 It occurs naturally in the minerals leucite, pollucite, carnallite, zinnwaldite, and lepidolite,although none of these contain only rubidium and no other alkali metals. :70 Caesium is more abundant than some commonly known elements, such as antimony, cadmium, tin, and tungsten, but is much less abundant than rubidium. Francium-223, the only naturally occurring isotope of francium, is the product of the alpha decay of actinium-227 and can be found in trace amounts in uranium and thoriumminerals. In a given sample of uranium, there is estimated to be only one francium atom for every 1018 uranium atoms. It has been calculated that there is at most 30 g of francium in the earth’s crust at any time, due to its extremely short half-life of 22 minutes. Salt flats are rich in lithium, such as these in Salar del Hombre Muerto, Argentina (left) andUyuni, Bolivia (right). The lithium-rich brine is concentrated by pumping it into solar evaporation ponds (visible in Argentina image). The production of pure alkali metals is difficult due to their extreme reactivity with commonly used substances, such as water. The alkali metals are so reactive that they cannot be displaced by other elements and must be isolated through high-energy methods such as electrolysis. Potassium occurs in many minerals, such as sylvite (potassium chloride). 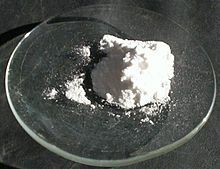 It is occasionally produced through separating the potassium from the chlorine in potassium chloride, but is more often produced through electrolysis of potassium hydroxide,found extensively in places such as Canada, Russia, Belarus, Germany, Israel, United States, and Jordan, in a method similar to how sodium was produced in the late 1800s and early 1900s. It can also be produced from seawater. Sodium occurs mostly in seawater and dried seabed, but is now produced through electrolysis of sodium chloride by lowering the melting point of the substance to below 700 °C through the use of a Downs cell. Extremely pure sodium can be produced through the thermal decomposition of sodium azide. Francium-223, the only naturally occurring isotope of francium, is produced naturally as the product of the alpha decay of actinium-227. Francium can be found in trace amounts in uranium and thorium minerals; it has been calculated that at most there are 30 g of francium in the earth’s crust at any given time. As a result of its extreme rarity in nature, most francium is synthesized in the nuclear reaction 197Au + 18O → 210Fr + 5 n, yielding francium-209, francium-210, and francium-211. The greatest quantity of francium ever assembled to date is about 300,000 neutral atoms, which were synthesized using the nuclear reaction given above. From their silicate ores, all the alkali metals may be obtained the same way: sulfuric acid is first used to dissolve the desired alkali metal ion and aluminium(III) ions from the ore (leaching), whereupon basic precipitation removes aluminium ions from the mixture by precipitating it as the hydroxide. The remaining insoluble alkali metal carbonate is then precipitated selectively; the salt is then dissolved in hydrochloric acid. The result is then left to evaporate and the alkali metal can then be isolated through electrolysis. Lithium and sodium are typically isolated through electrolysis from their liquid chlorides, with calcium chloride typically added to lower the melting point of the mixture. The heavier alkali metals, however, is more typically isolated in a different way, where a reducing agent (typically sodium for potassium and magnesium or calcium for the heaviest alkali metals) is used to reduce the alkali metal chloride. The liquid or gaseous product (the alkali metal) then undergoes fractional distillation for purification. Lithium, sodium, and potassium have many applications, while rubidium and caesium are very useful in academic contexts but do not have many applications yet. :68 Lithium is often used in batteries, and lithium oxide can help process silica. Lithium can also be used to make lubricating greases, air treatment, and aluminium production. Pure sodium has many applications, including use in sodium-vapour lamps, which produce very efficient light compared to other types of lighting, and can help smooth the surface of other metals. Being a strong reducing agent, it is often used to reduce many other metals, such as titanium and zirconium, from their chlorides. :74 Sodium compounds have many applications as well, the most well-known being table salt. Sodium is also used in soap as salts of fatty acids. Potassium compounds are often used as fertilisers:73 as potassium is an important element for plant nutrition. Potassium hydroxide is a very strong base, and is used to control the pH of various substances. Francium has no commercial applications, but because of francium’s relatively simple atomic structure, among other things, it has been used in spectroscopy experiments, leading to more information regarding energy levels and the coupling constants betweensubatomic particles. Studies on the light emitted by laser-trapped francium-210 ions have provided accurate data on transitions between atomic energy levels, similar to those predicted by quantum theory. Sodium and potassium occur in all known biological systems, generally functioning as electrolytes inside and outside cells. Sodium is an essential nutrient that regulates blood volume, blood pressure, osmotic equilibrium and pH; the minimum physiological requirement for sodium is 500 milligrams per day. Sodium chloride (also known as common salt) is the principal source of sodium in the diet, and is used as seasoning and preservative, such as for pickling and jerky; most of it comes from processed foods. The DRI for sodium is 1.5 grams per day, but most people in the United States consume more than 2.3 grams per day, the minimum amount that promotes hypertension; this in turn causes 7.6 million premature deaths worldwide. Potassium is the major cation (positive ion) inside animal cells, while sodium is the major cation outside animal cells. The concentration differences of these charged particles causes a difference in electric potential between the inside and outside of cells, known as the membrane potential. The balance between potassium and sodium is maintained by ion pumps in the cell membrane. The cell membrane potential created by potassium and sodium ions allows the cell to generate an action potential—a “spike” of electrical discharge. The ability of cells to produce electrical discharge is critical for body functions such as neurotransmission, muscle contraction, and heart function. Rubidium has no known biological role, but may help stimulate metabolism, and, similarly to caesium, replace potassium in the body causing potassium deficiency. Caesium compounds are rarely encountered by most people, but most caesium compounds are mildly toxic because of chemical similarity of caesium to potassium, allowing the caesium to replace the potassium in the body, causing potassium deficiency. Exposure to large amounts of caesium compounds can cause hyperirritability andspasms, but as such amounts would not ordinarily be encountered in natural sources, caesium is not a major chemical environmental pollutant. The median lethal dose (LD50) value for caesium chloride in mice is 2.3 g per kilogram, which is comparable to the LD50 values of potassium chloride and sodium chloride.Caesium chloride has been promoted as an alternative cancer therapy, but has been linked to the deaths of over 50 patients, on whom it was used as part of a scientifically unvalidated cancer treatment.Radioisotopes of caesium require special precautions: the improper handling of caesium-137 gamma raysources can lead to release of this radioisotope and radiation injuries. Perhaps the best-known case is the Goiânia accident of 1987, in which an improperly-disposed-of radiation therapy system from an abandoned clinic in the city of Goiânia, Brazil, was scavenged from a junkyard, and the glowing caesium salt sold to curious, uneducated buyers. This led to four deaths and serious injuries from radiation exposure. Together with caesium-134, iodine-131, and strontium-90, caesium-137 was among the isotopes distributed by the Chernobyl disaster which constitute the greatest risk to health. Francium has no biological role and is most likely to be toxic due to its extreme radioactivity, causing radiation poisoning, but since the greatest quantity of francium ever assembled to date is about 300,000 neutral atoms, it is unlikely that most people will ever encounter francium.